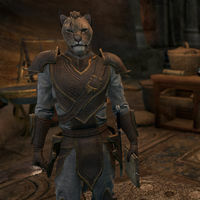 Abiznaz is a Khajiit merchant and part of the group of outlaws found at their refuge beneath the city of Sentinel. He is located in the southeast corner, next to Uazee. "I'm sorry, but the Guard confiscated all of my equipment. I can't make any poisons for you, so do not ask." "I sell hundreds of poisons a year, and just because one ends up in the goblet of King Fahara'jad's taster, I'm some kind of criminal?" He is the author of The Dose Makes the Poison, written under the pseudonym of Zanziba the Clever which can be found right behind his store counter. Zanziba is his name spelled backwards. This page was last modified on 27 July 2018, at 11:46.